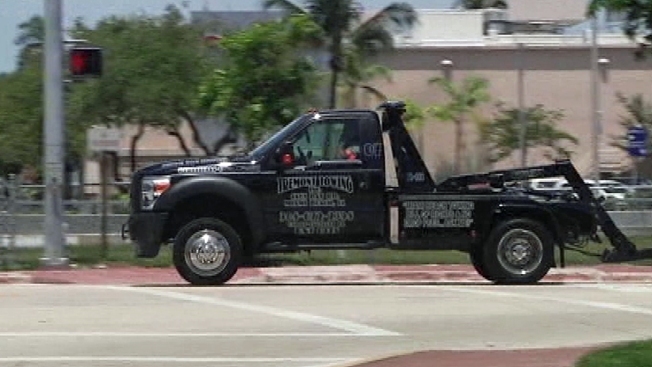 A Tow Truck makes it way around Miami Beach. One year after Team 6 Investigators found tow truck companies here improperly hauling away cars without using safety chains, a follow-up investigation found the companies are now largely toeing the line. Last year, none of the tows we witnessed involved the use of the chains, which prevent a vehicle that may slip off the tow bar from careening uncontrolled on city streets, endangering pedestrians and other motorists. In recent weeks, we found 27 of 30 tows we witnessed did use the chains – a 90-percent compliance rate. Several weeks ago he said he watched as an unchained Jaguar came unhinged from a tow truck turning onto a wet highway in Hialeah Gardens, causing slight damage. Tobin, who is hoping to soon leave the commission for a job as a rookie police officer, could become one more set of eyes on the tow trucks’ safety chain compliance. An attorney who has represented the tow truck companies did not return a call for comment on their improved performance.